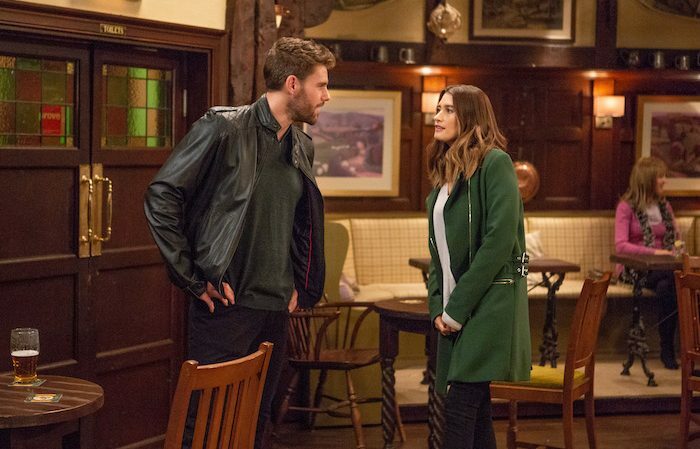 EMMERDALE EPISODES: It won’t be a Happy New Year for long in Emmerdale as familiar faces return and immediately causes havoc, with Mandy Dingle causing problems for Chas and Paddy while Lachlan White still has an impact on Belle. 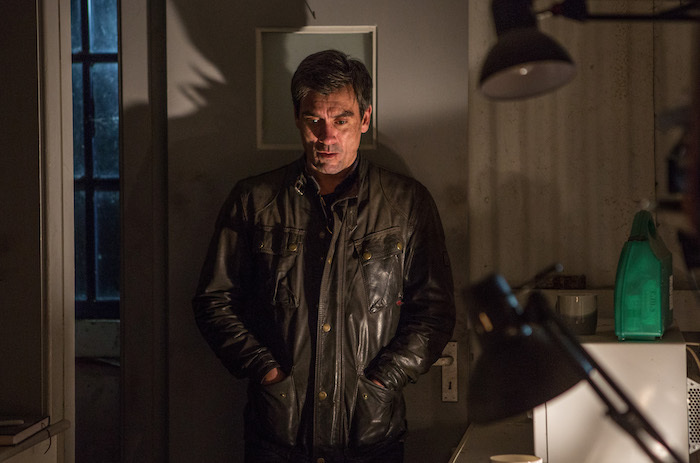 A mysterious figure puts Vanessa’s life on the line as well as Jonny’s. Meanwhile, Dr Cavanagh has a suggestion for Bernice and Cain and Graham struggle with their guilt. Mon 7 Jan 2019: Marlon Dingle is disappointed when April reveals she’s not attending Marlon and Jessie’s official wedding. 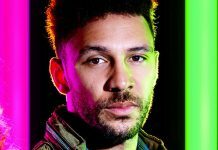 Mon 7 Jan 2019: Marlon and Jessie feel as though their chances of finding a second witness are slowly getting thinner, but they manage to coerce a passing Jimmy King into joining in the festivities. 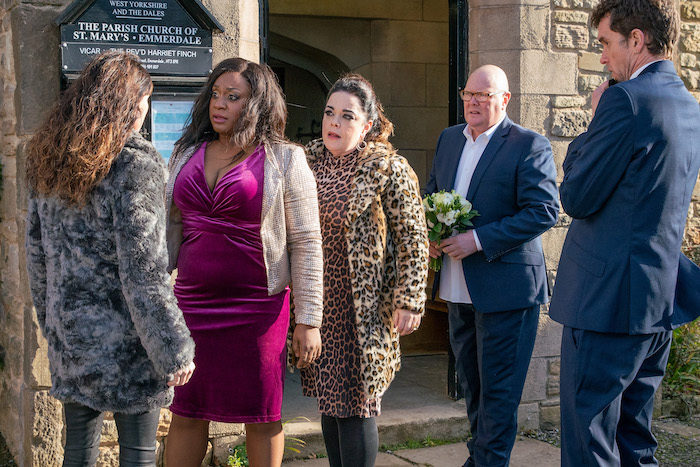 Mon 7 Jan 2019: Later, as the ceremony gets underway they are rudely interrupted as Mandy Dingle bursts through the door, much to the shock and awe of Marlon and Paddy. 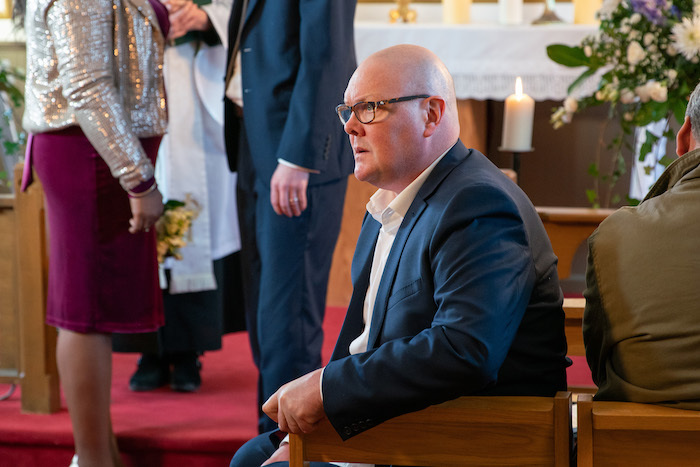 Mon 7 Jan 2019: Jimmy is relieved when he’s sent home, and an awkward Paddy is uncomfortable as Mandy Dingle takes her place as the second witness. 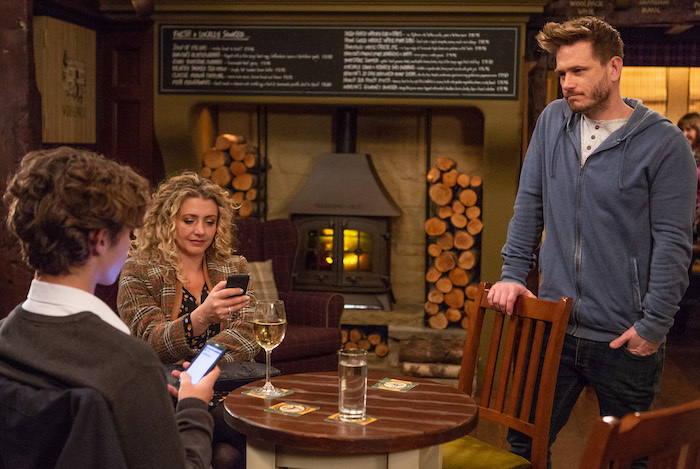 Mon 7 Jan 2019: A vulnerable Chas Dingle leaves a message on Paddy Kirk’s phone. 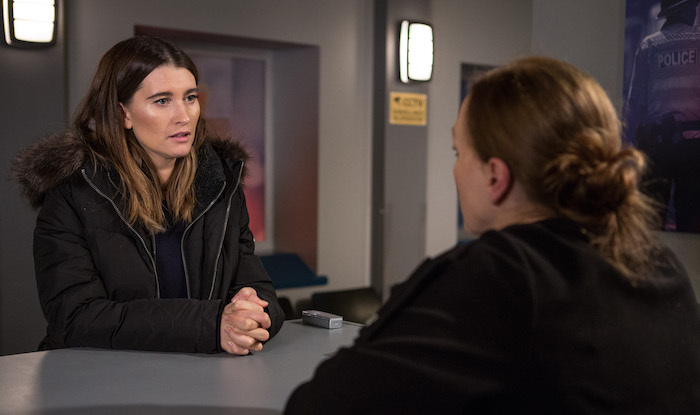 Mon 7 Jan 2019: Feeling the strain, Chas sets off to find Paddy – and when she does all hell breaks loose! Mon 7 Jan 2019: An emotional Chas finally snaps and attacks Mandy Dingle. Mon 7 Jan 2019: Jesse Grant steps in to try and calm things down between Chas and Mandy. 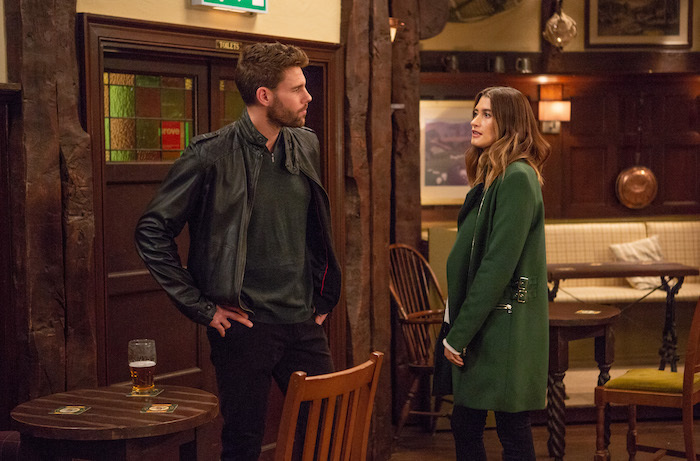 Tues 8 Jan 2019: Accompanied by Sam Dingle, Belle Dingle faces her former boyfriend Lachlan White. 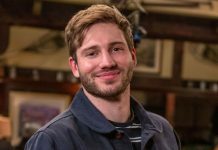 Tues 8 Jan 2019: Belle isn’t fooled by Lachlan White’s display of remorse but Sam believes he’s genuinely changed. Tues 8 Jan 2019: Lydia Hart receives a frantic phone call from Sam Dingle. 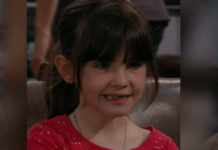 Tues 8 Jan 2019: Lydia and Belle Dingle arrive at the Dingles, they see Sam is covered in blood. 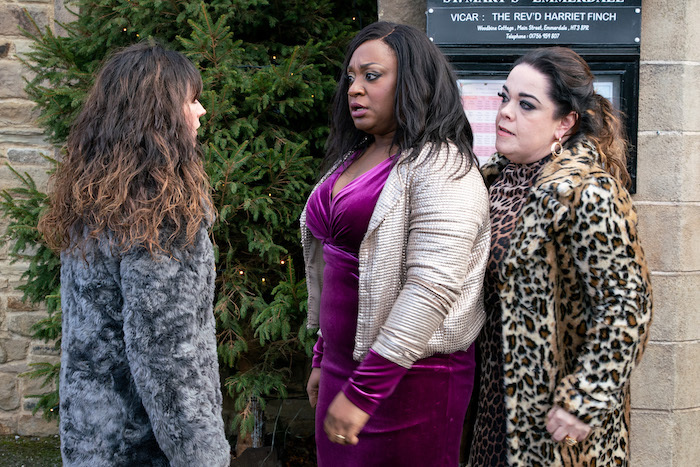 Tues 8 Jan 2019: Sam Dingle tells Lydia and Belle that Gloria the pig has been killed. 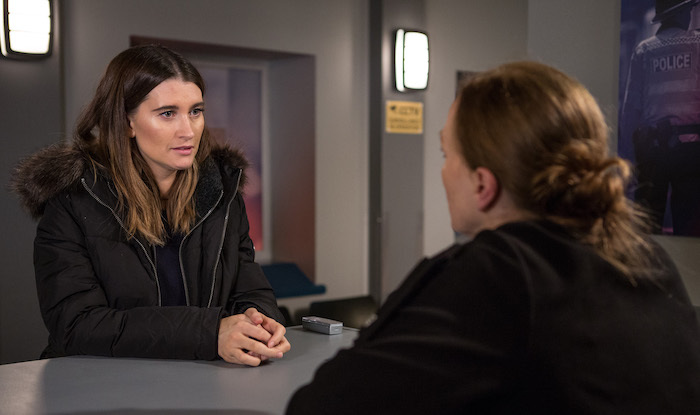 Tues 8 Jan 2019: Confused and worried, Debbie Dingle arrives at the police station. 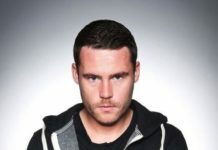 Tues 8 Jan 2019: Debbie Dingle reports Joe Tate as a missing person to the police. 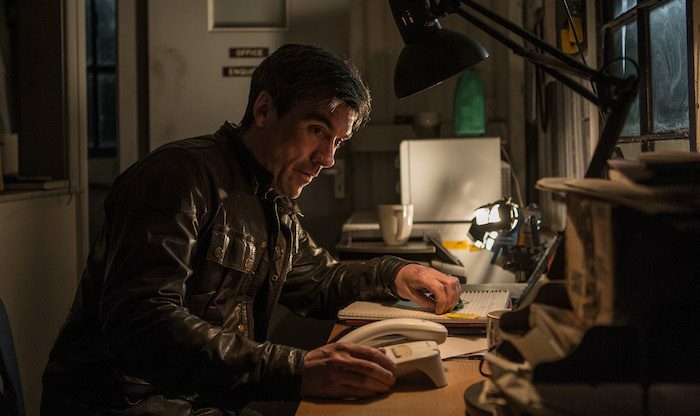 Wed 9 Jan 2019: Graham downs a whiskey as Cain Dingle feels the net closing in on him. 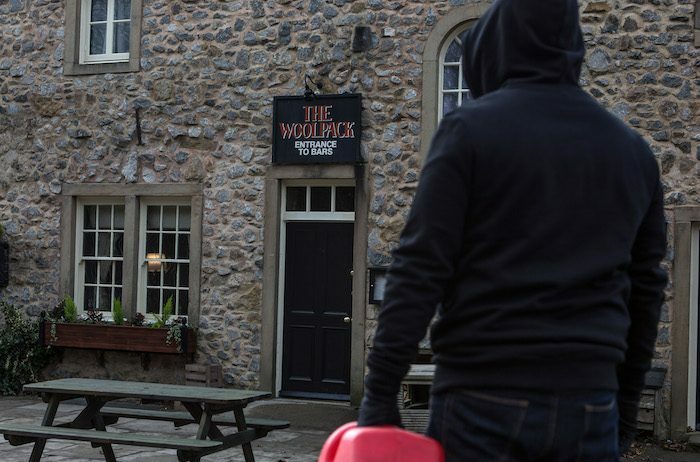 Thurs 10 Jan 2019 – 7pm: A hooded figure stares at the Woolpack, a can of petrol in his hand. Thurs 10 Jan 2019 – 7pm: Who is the hooded figure and what is he planning to do to the pub? 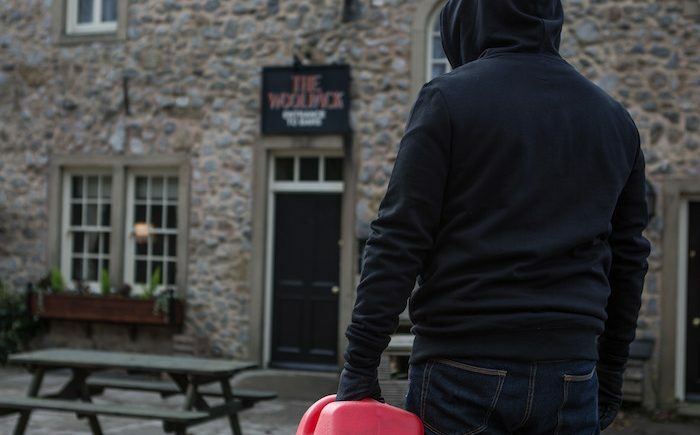 Thurs 10 Jan 2019 – 7pm: The hooded man starts pouring petrol over the back door of the Woolpack. 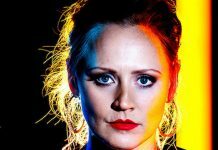 Thurs 10 Jan 2019 – 7pm: A returning Vanessa Woodfield is thrown to find a man splashing petrol round the bins. 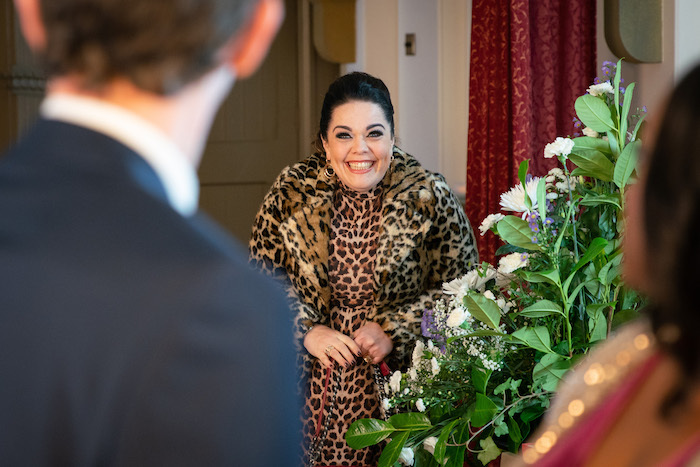 Thurs 10 Jan 2019 – 7pm: Vanessa confronts the hooded figure but he stabs her. Thurs 10 Jan 2019 – 7pm: Vanessa is soon left fighting for her life after being stabbed in the stomach. 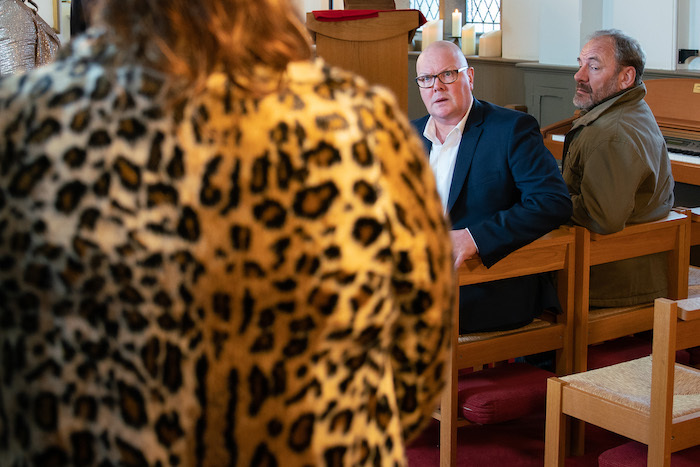 Thurs 10 Jan 2019 – 8pm: As it all becomes too much for Graham Foster, he confides in Laurel Thomas about his alcoholism and she urges him to open up to Megan. 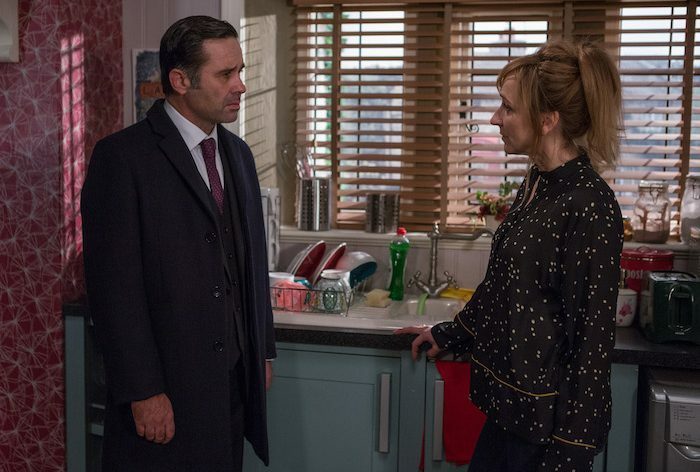 Thurs 10 Jan 2019 – 8pm: Firm Diane assures Bernice Blackstock she will have to pull her weight and pay for the B&B if she plans on staying there. 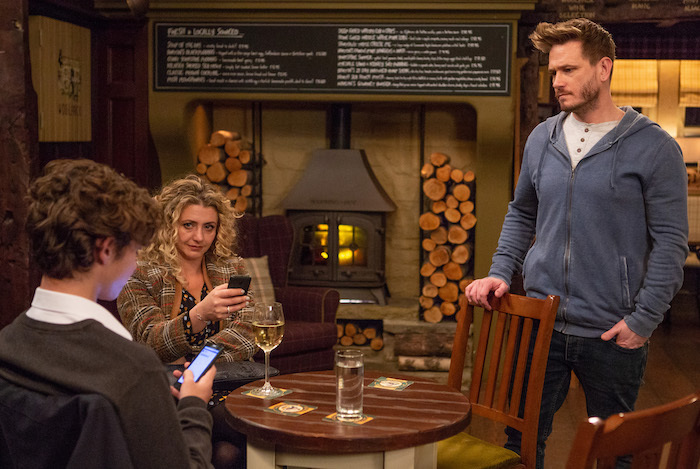 Thurs 10 Jan 2019 – 8pm: Later, seething Bernice rants to Liam Cavanagh about her living situation. 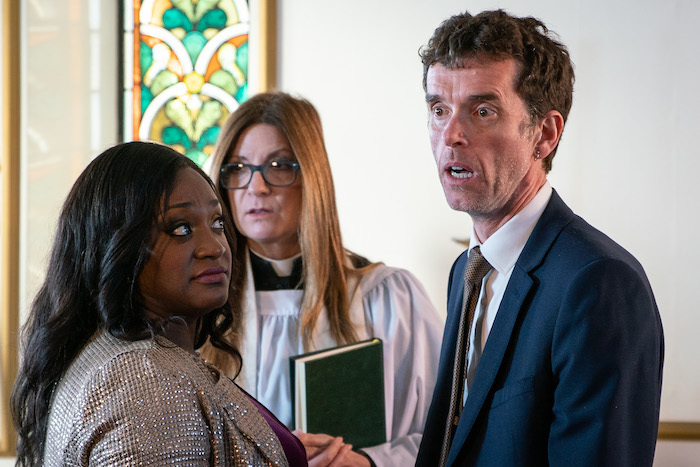 Thurs 10 Jan 2019 – 8pm: Bernice is all ears when Liam Cavanagh comes up with a solution that could benefit them all. 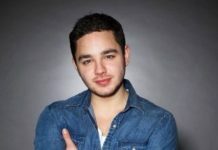 Thurs 10 Jan 2019 – 8pm: In an attempt to make Debbie Dingle forget about Joe Tate, Cain plays cupid with her and a client. 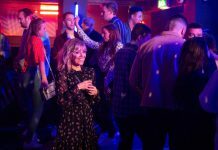 Thurs 10 Jan 2019 – 8pm: Will Debbie Dingle fall for Cain’s plan and the client? 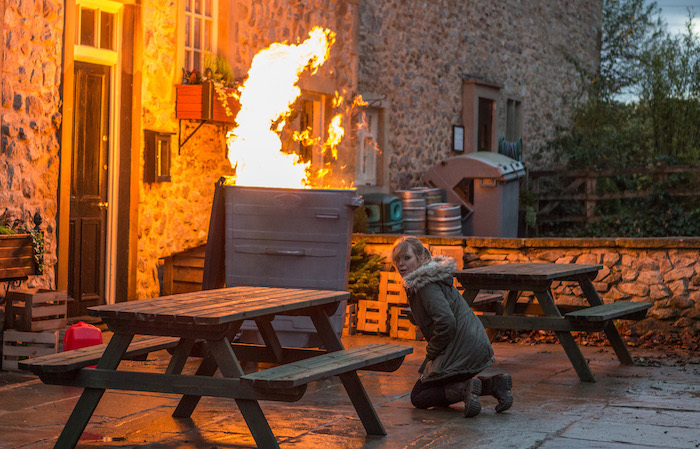 Thurs 10 Jan 2019 – 8pm: As the bins burn at the back of the Woolpack, Vanessa cries for help. 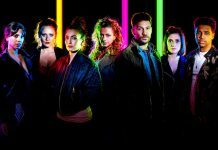 Thurs 10 Jan 2019 – 8pm: Who will come to Vanessa’s rescue as she bleeds at the back of the Woolpack? Thurs 10 Jan 2019 – 8pm: The flames grow as the door of the pub catches fire. 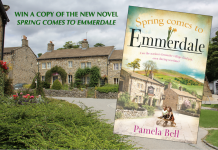 Will someone come to help save Vanessa and the Woolpack? 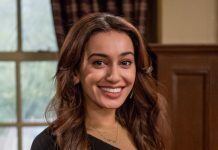 Fri 11 Jan 2019: Scheming Maya offers to give Jacob Gallagher some private tuition. David is none the wiser as Jacob’s heart is left pounding at the thought. Fri 11 Jan 2019: The chemistry between Maya and Jacob crackles as he praises her for her private tuition idea.